Day 7: Winnipeg, MB to Regina, SK. Ready to continue our journey westward, we set out from our hotel at 7:30 this morning, following Route 1, the Trans-Canada Highway. An hour into our trip, we stopped at Portage la Prairie, Manitoba's fourth largest city with a population of 12,996. Slightly smaller than Texas in area, the entire province of Manitoba has a population of 1.3 million, with 700,000 living in and around Winnipeg and the rest distributed over the vast remainder of the province. After a fruitless search for a letterbox in Portage, we turned northwest onto Highway 16, which our AAA map had branded a scenic route. 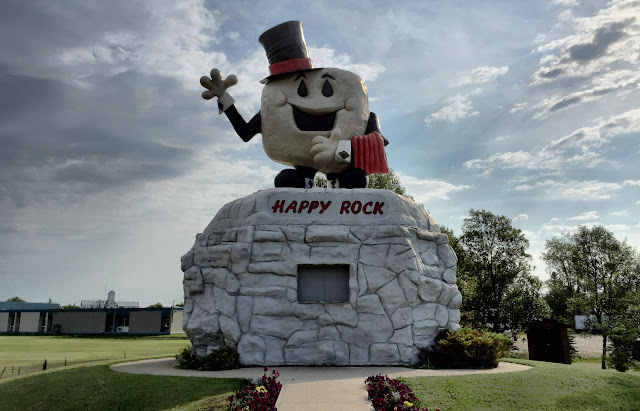 The flat, featureless fields along the route left us puzzled over the designation, but the road did take us to Gladstone, home of the Happy Rock, aka a glad stone. This rock-shaped visitor center certainly delighted us because it offered some very clean, well-maintained facilities. Happy Rock or Glad Stone? Westward we drove on the "scenic" 16 into the town of Neepawa (pop. 3,629), a regional retail and agricultural service center. From the Cree word meaning "land of plenty," Neepawa and the surrounding area once had an abundance of bison. At the town's municipal Riverside Cemetery, we found a letterbox honoring Margaret Laurence, a beloved Canadian author and Neepawa native. Placed in 2010, the box had been visited only three other times in this remote town. 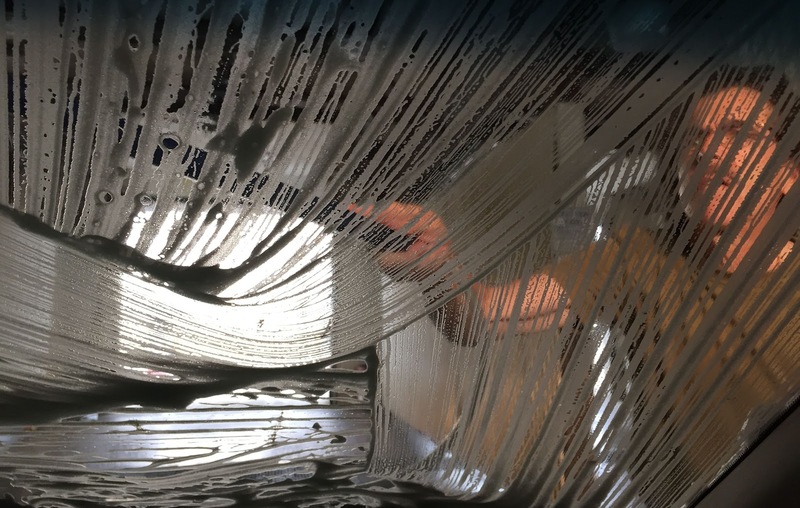 Like us, the previous visitor was more than 1,700 miles from home. Georgia Candy Girl, also from the Atlanta area, had recorded her visit to the box three months ago. The colorful cemetery was teeming with cemetery staff today watering flowers and keeping the toadstool-shaped evergreen trees neatly trimmed. Every year the town plants 60,000 white, pink, red, violet, and lilac petunias in beds around the 2,500 graves in the cemetery with the town's unusual "perpetual care" plan initiated in the 1950s. 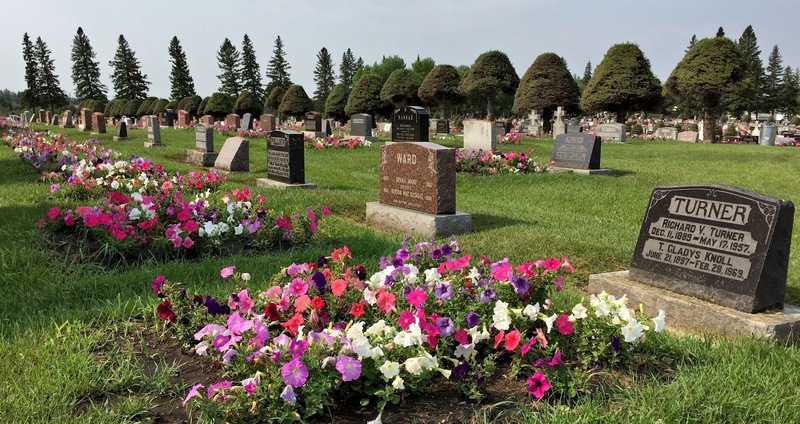 Not only did the cost of purchasing a burial plot include mowing the grass and keeping the headstone straight, Neepawa took it a step further and promised to plant flowers in front of the grave—in perpetuity. Still on the bottom fold of the Manitoba map, as we moseyed on westward toward Saskatchewan, we became curious about a crop we could not identify. And with cellular data turned off to avoid heavy international roaming charges, we were unable to ask Siri or Google. 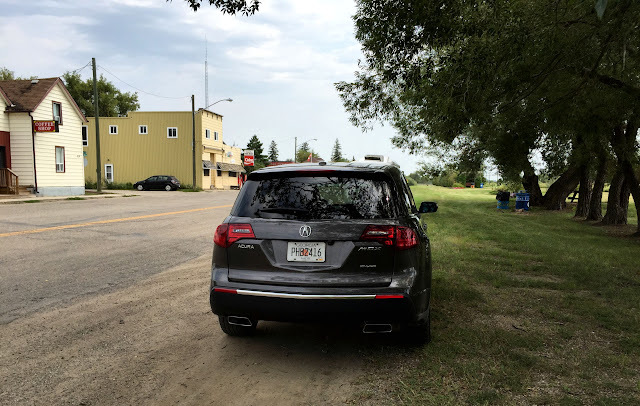 A few miles past Neepawa, near the tiny crossroads of Franklin, we turned north on a quiet secondary road to get a closer look. As we were sitting in the car pondering, an approaching southbound pickup truck slowed and, stopped in response to Ken's arm outside the window flagging. 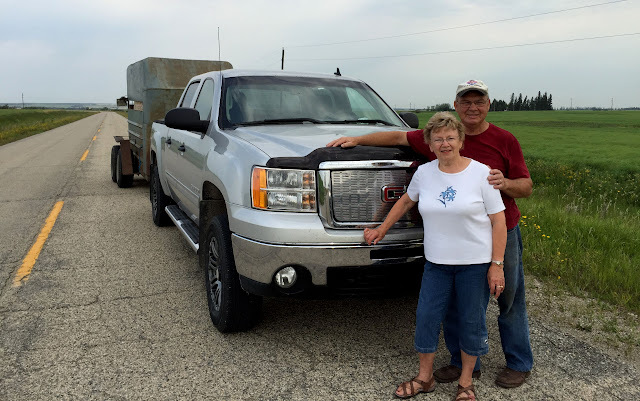 It was Don, a retired grain elevator supervisor from Franklin, and his wife Evelyn. They promptly identified the mystery crop as canola. In an interesting coincidence, canola was originally developed through cross-breeding from rapeseed at the University of Manitoba in the early 1970s. Unlike natural rapeseed, canola is deemed safe for human consumption because it contains much less acid than rapeseed. The name canola reputedly derives from CAN(ada) + O(il) + L(ow) + A(cid). We had been sitting in our respective vehicles on opposite sides of the road chatting for a few minutes when a truck approached behind us. So Don backed up and pulled over into the northbound lane in front of us. Then all four of us got out and stood there in the road visiting for about twenty minutes. We learned that their winter temps can get down to 40 below zero and that they visited Charleston and Myrtle Beach last year. They have traveled a good bit in the U.S., leading Don to remark that the border between Canada and the United States should be drawn north to south, rather than east to west. As he pointed out, Manitoba and the other western provinces have much more in common with the Dakotas, Iowa, and other states west than they do with Ontario, Quebec and the eastern provinces. 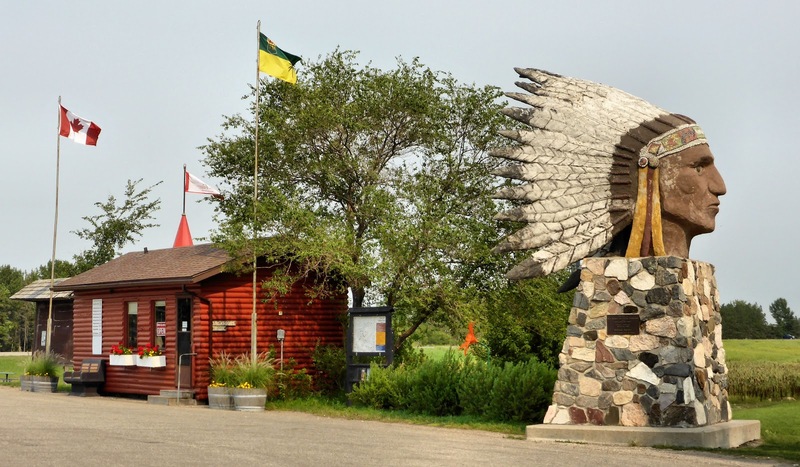 Traffic began to pick up a bit, so we said our goodbyes and we continued across the prairie, eventually giving up on the so-called scenic route and dropping back south to the four-lane Trans-Canada at Brandon. About twenty miles after we returned to Highway 1, we turned off on a side road looking for a place to picnic. Trees in that part of Manitoba are few and far between—usually seen only where cultivated—so we were delighted when we found a row of cottonwoods along the main street of the little hamlet of Alexander. An Ontario couple pulling a travel trailer had stopped nearby for the same purpose, though we never had an opportunity to compare lunches. Along TC-1 in Saskatchewan, every 20 to 30 miles, tiny towns broke up the monotony of massive fields and pastures. We were driving through Canada's breadbasket. Saskatchewan's agricultural soil is said to be among the richest in the world. 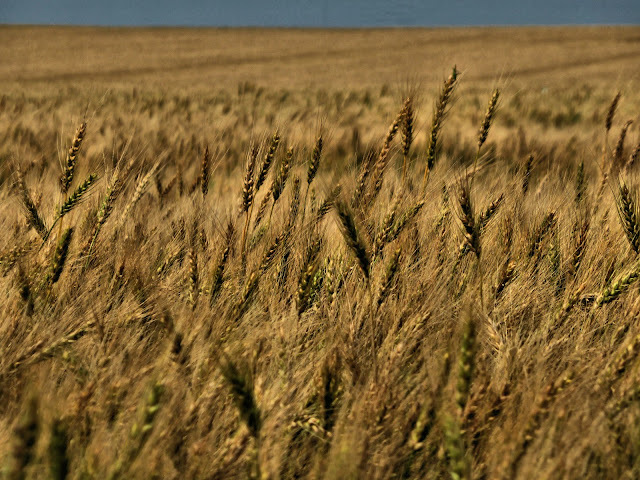 The province is the main producer of wheat in Canada and one of the largest in the world. They're here to pump us up. In the crossroads of Broadview (pop. 611), we stopped at the local Co-op station for gas. Apparently half the drivers passing by had the same idea, and the tiny station was overwhelmed by the volume. Two female attendants were steadily filling tanks and squeegeeing windshields at the station's four pumps. Numerous pickup trucks pulling camper trailers clogged the system as one of the tandem positions was often left idle while they filled up. 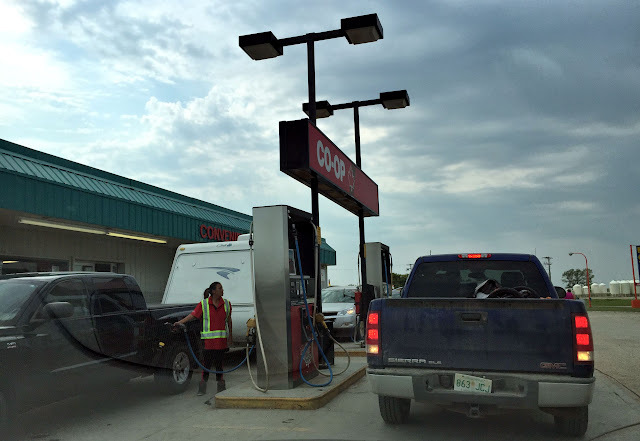 The station's popularity apparently stemmed from its lack of competition, not the price of fuel—$1.309 Canadian per liter (US$3.78/gallon). Maybe like us, other drivers were looking at a fuel indicator pointing to the big E and had no choice but waiting the quarter hour for their turn. All day we had seen clouds of small white cabbage butterflies flitting around fields and munching on crops. Once we entered Saskatchewan, they turned suicidal. Swarms of the snowy creatures constantly flitted across the highway, losing their lives on car windshields and grills like kamikaze pilots. Apparently the critters thrive in hot dry weather, which this area has experienced in unusual amounts this summer. 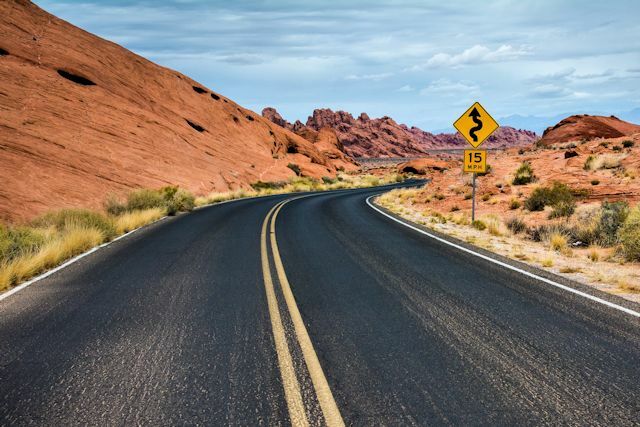 Since they can cycle through three to five generations in one season, there are plenty to replace the ones sacrificed on the highway. As we were to learn, yellow jackets consider these little carcasses gourmet dining. Any time we stopped the car, yellow jackets would flock to the front of our vehicle and begin feasting as if a banquet invitation had been issued. 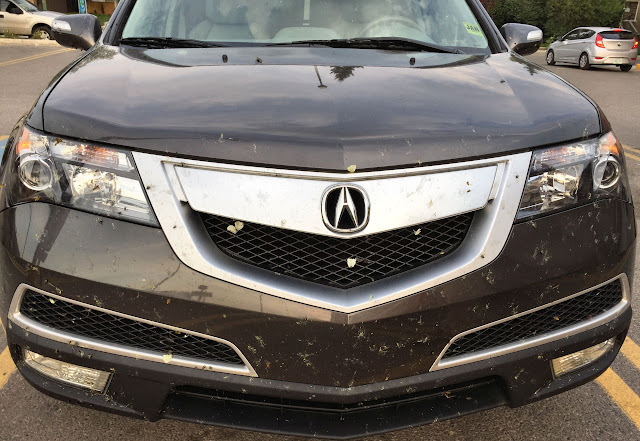 After arriving in Regina and checking in at the Doubletree, we thought it wise to locate a car wash and remove the yellow jacket magnets before they decided to just move in for convenience. Since Regina is provincial capital, tomorrow we'll visit the Saskatchewan legislative building.